If you follow me on Instagram, then you know I’m an avid believer in Bullet Journaling. The analog process of tracking my tasks by day, week, and month, which was designed by Ryder Carroll, is what has kept my life and Ackerly Green Publishing mostly on track these past few years. But in that time I’d also been swept up in the #bujo movement, where people design more and more elaborate layouts and pages in their bullet journals, expressing their art and creativity through the system meant for productivity. Recently, I’d started noticing that all these beautifully drawn pages that I was liking, bookmarking, and saving on Instagram, Reddit, and Pinterest, often had 3-4 tasks a day on them. :/ On any given day, I could realistically have 15-20 real, action-necessary tasks due. It turns out, I was spending too much time designing my bullet journal and not enough time doing the work the bullet journal was supposed to be helping me track. It took me a while, but I realized by the end of 2018 that yes, bullet journaling was keeping me from drowning in the never-ending flood of tasks involved with writing interactive novels and running a publishing company, but #bujo as an “art” was killing me. I needed a break from the beauty of my bullet journal. I needed a more efficient way to assemble my daily, weekly, and monthly schedules without having to draw it all out. I needed a less time-consuming method to help me manage my time and be productive. It had to be somewhat aesthetically pleasing. I considered the Moleskine Daily Planner, but it didn’t have a weekly layout. So I started with the much-lauded Hobonichi Techo which had all three required layouts and was A5. 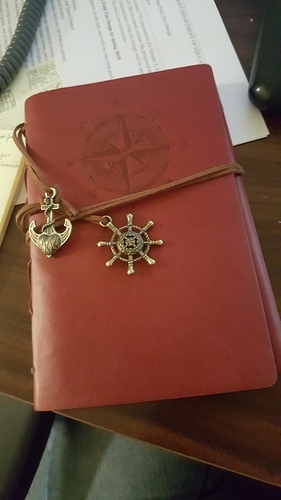 While it didn’t have very many blank pages for free writing, I had already decided that I could compromise and carry two journals, one for planning, one for writing since they’d both fit in my new cover. I loved the Techo. I dug the appearance and the structure, which would allow me to hit the ground running in the morning (or the night before) without having to design a layout, but in the end, it was the paper I didn’t love. It was too thin, and though that might not be a problem for most people, I use either a Lamy2000 fountain pen or a Tombow Mono Drawing Pen for writing, and they both bled through the beautiful but vellum-like pages of the Techo. I didn’t have a lot of other options that I found both practical, useful, and aesthetically pleasing, so I turned to a handful of “planner systems.” Planners that have guides and rulesets, like Panda Planner, the Full Focus Planner, and the SELF Journal. Though I love Panda Planner’s take on daily planning, gratitude, and mindfulness, the design of their layouts looked a little too… Outlook 2000 for my tastes. The Full Focus planner was a serious contender, but… not A5, and I swear that the cover I ordered, which literally just shipped from Denmark today, is SO worth not compromising on the size. Best Self Co.’s SELF Journal arrived on a Friday afternoon. It comes in its own little box, a starter guide, an adhesive pen loop, a place to design and track your morning and evening routines (another game changer for me,) and a wall calendar to help visualize and monitor your productivity progress. I literally got into bed with the starter guide because for this massive process nerd, it was like a cozy bedtime story. The guide touted the importance of mindfulness, gratitude, and purpose, but also talked about science-backed systems like breaking your work year into quarters and focusing on three primary priorities to help you manage your work goals and stay present. I know all that might seem obvious to a lot of you, but that was an eye-opening moment for me. I felt like I was never “in the moment” in 2018 because my focus was always scattered across a hundred things I wanted to do or had to do on that day, the next week, two months later, the next six months, the next two years. It was overwhelming me, wearing me down, and also burning me out on a job that I love with all my heart. So I started a test run on the SELF Journal the next morning, outlining the work I had to accomplish that Saturday. The SELF has an area where you list your three primary goals for the quarter, and then break them down into actionable steps that then filter into your weekly and daily layouts. You always have a clear idea of what you’re working toward and what you need to do to get there. You also have areas to track your overall goals, for the day, the week, or life in general if you want. There’s a lot of flexibility in the structure. There’s also room in each day layout to track things you learned and want to improve on, things you’re grateful for, big wins for the day, and a place to reflect on your progress once the day’s over. It all adds up to a feeling of being in the moment (at least for me, but I imagine that’s the point of the system) and eating the elephant one bite at a time. I ended every “workday” last week early. Like, done for the day. Yes, there were things I could’ve done, but I felt accomplished and ready to end my workday, every day because I knew I’d moved the ball forward on my primary goals. I didn’t work over the weekend. I almost ALWAYS work through weekends. I didn’t realize how unhealthy it was until I didn’t work this weekend and actually got to spend time with my family and recuperate from the week. I read more in the past ten days than I have in the last six months of 2018. Not kidding. I got halfway through two books (I like to read one fiction and one non-fiction at any given time) because I made reading an important part of my morning and evening routine with SELF’s routine placard. Best of all, I planned out and wrote almost 15,000 words last week. If that’s not the best way to kick off 2019, I don’t know what is. Literally everything I said above. This thing is awesome. The Self doesn’t have a ton of pages for freewriting, but as I said, I already knew I was probably going to have two separate journals. I did end up buying Best Self’s Scribe journal to pair with the SELF, which is a beautiful blank journal with dotted pages, but I think I’ll go back to a Leuchtturm1917 when I’ve finished the Scribe. Only because the Scribe doesn’t have numbered pages, and anything that helps me be more efficient in 2019 is the thing that gets my vote. Numbered pages help me more easily track my writing in a table of contents. So my new arsenal is a SELF Quarterly journal, and once I’m through the Scribe (no need to waste), I’ll go back to a basic dotted Leuch for writing. The SELF is bound in a way that doesn’t allow you to run a cord through its spine Traveler journal style, which is a bummer. You’d have to cord it in between pages. Luckily, the cover I ordered (did I mention I ordered a journal cover, and I’m excited about it?) has a full pocket in the back, so fingers crossed that the back cover of the journal will fit into that pocket. I’ve already bought a SELF for Catherine because of the positive effect it’s had on my productivity and work life (and she’s duly obsessed as well), but it’s also had a noted impact, unexpectedly, on my personal life. I’m reading more, meditating every day, coming home feeling accomplished and done with work so I can be more present with my husband and kids. Seriously, this isn’t an ad. This is my honest reaction. The positive changes I’ve experienced were a completely unexpected part of this whole process. I just wanted to change the way I plan, but in the end found a system that, I feel, is going to change everything about how I work. Thank you for helping me find something new to obsess over in 2019. Ahhhhh! Okay, first of all, stop eating elephants. I’ve heard it’s bad for you. Also for the elephants. Second, I wanted to appreciate this journey with you and chime in on how fantastic it feels to find an organizational system that fits you and helps you grow. I have never been a “planner” person. I remember all of my schools from day school through college handing out planners to use for writing down aasignments. Unless my teachers required me to use them, I would always write in the things for a week and then lose it, forget about it, or decide it was laid out too badly to salvage and throw it away. It wasn’t even that I hated systems, I just hated that these systems weren’t mine. They didn’t get that I wanted a BIGGER space for weekends to write down important plans, or places to jot down notes, or they were made with bad art on the pages and just kind of ugly, and I had to remember to bring a whole other notebook with me if I wanted to write or draw, and they were always such an awkward size anyway and would get lost in a backpack but wouldn’t go in a purse, and…wow, okay, more resentment there than I realized. Anyway, by college I had reached a point where I’d just given up on a useful planner altogether, and that was its own disaster. @Deyavi low-key turned me on to BuJo recently when I was noticing some really bad patterns of not remembering things and getting things done in my life and not sure how to handle it. I’ve since been sort of feeling my way through something BuJo adjacent, and it’s honestly quite exciting. By “BuJo adjacent,” I mean I read maybe two articles on the overarching concept, jumped on Amazon, and resolved to order the notebook that made me most excited about using it. This turned out to be a red A6 ring journal, supplemented with some insertable packs of graph and dot paper. It’s working pretty well so far; I use some of the BuJo notation styles, and I’m currently allowing myself two pens (until I inevitably lose one and have to replace it) to set up and design the pages I need. What I am absolutely NOT doing is looking at any social media pictures of other people’s Bullet Journals, because that will help me exactly not at all with what I need this book to do, which is provide a frame of goals and to-dos that rewards my completion of said goals and doesn’t make me want to tear out my own hair. I think my method is working for me because I’m excited to use it, unlike any other planner I’ve been handed before, and that feeling is just phenomenal and world-changing. Okay, carry on. Being a follower of several very creative bloggers and YouTubers who BuJo, with monthly plan-with-mes and journal set-ups, lettering tutorials, and painting, one thing I have noticed among the best and most prominent of them is that even for them, 2018 became the Year of the Fancy Bujo, the Distraction of Design, and Self-Consciousness of Not Being as Good as That Guy. 2019, I hope, will be the year of using planners for planning, and making your life better, the way they were intended.